The Bright Kiss Ketubah bursts with joy—and we wouldn’t have it any other way! Combining bold, bright colors with a classic depiction of the Jewish Bride and Groom, the intricacy of the design adds a whimsical feel to the most exciting day of the year. From the warmth of the couple’s embrace to the beautiful roses framing the design, we couldn’t wait to share the beauty of this Ketubah! Don’t quite see yourself in the Bright Kiss Ketubah? Team Ketubah can customize it for you! 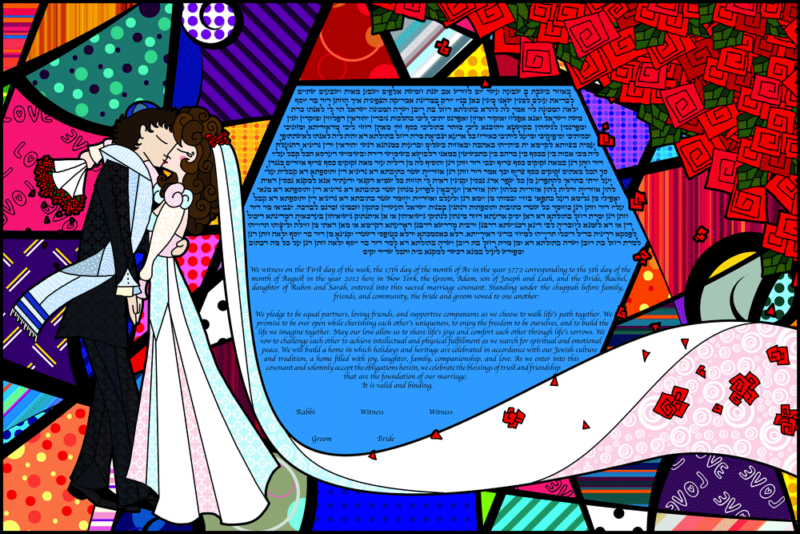 From the couple’s hair color to the LOVE panels in the background, our Collective’s artists can create an incredibly personalized Ketubah for you and your fiancé(e). Let’s Get Started!